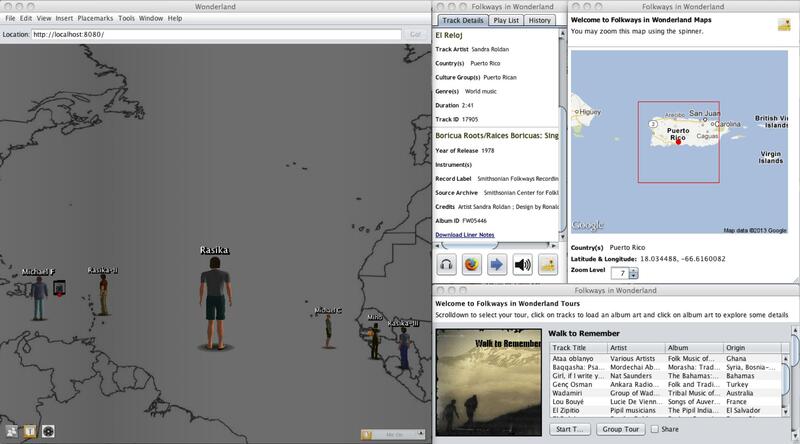 Folkways in Wonderland (FiW) is a cyberworld for musical discovery with social interaction, allowing avatar-represented users to explore selections from the Smithsonian Folkways world music collection while communicating through text and audio channels. FiW is built on Open Wonderland, a framework for creating collaborative 3D virtual worlds. FiW is populated with track samples from Folkways Recordings. Since acquiring the label in 1987, Smithsonian Folkways has expanded and digitized the Folkways collection while enhancing and organizing its metadata, all of which are now available electronically. FiW is collaborative: multiple avatars can enter the space, audition track samples, contribute their own sounds (speech or other) to the soundscape, and also communicate through text chat. Nearby users can hear music together, as well as hear and see each other. Wonderland also provides in-world collaborative applications, such as a shared web browser or whiteboard. Thus users are provided with a real-time, immersive, audiovisual representation of the virtual sociomusical environment, together with multiple means of communicating within it. This according to “Folkways in Wonderland” by Rasika Ranaweera, Michael Frishkopf, and Michael Cohen (Sound matters 3 March 2015). Above, a screenshot of a typical session (click to enlarge); below, a brief demonstration.